In line with their goal to expand their global footprint in the engineering and R&D community. Dexmet has decided to launch a new mobile responsive site that is user-friendly. The updated site includes an enhanced interface, updated technical content, and application-specific information to help the engineering community determine if expanded material is a viable, and cost-effective solution to use in their designs. 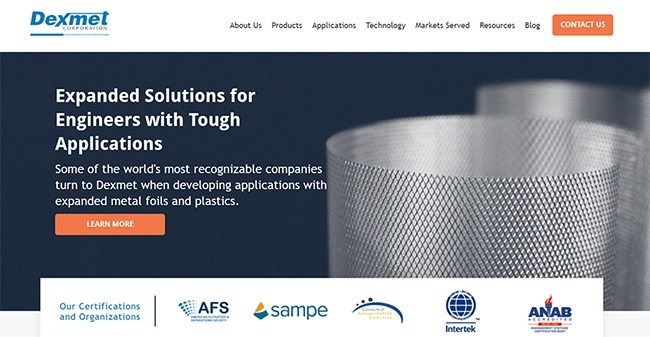 The new site will contain test data and white papers regarding the usage and benefits of ductile expanded open area material over perforated, or woven wire material. End-users will still have the option to opt-in by e-mail and download data sheets, and white papers covering topics on the usage of expanded materials incorporated into applications that are currently in use and developed for aerospace, power, filtration, industrial, and structural markets. Dexmet has taken great care to ensure that the site readability and navigation will help engineers find the information they need quickly. Engineers still have the option to call in or send Dexmet a quick email but using the form on the site allows users to input specific information needed for Dexmet to provide an accurate and quick response to questions on how expanded materials are actually designed into the product application. While Dexmet provides primarily open area solutions, calling Dexmet or visiting the new website is a great way to determine if expanded materials are viable for your designs. Dexmet corporation history goes back to 1948 and was the first precision expanded metal manufacturer to develop expanded material that met the needs of many technology applications. Dexmet supplies expanded materials that are used in fuel cells, composites, EMI shielding, electronics, solar power, filtration, marine, aircraft, and automotive applications. The new website is found at dexmet.com.